My last post, Game Placebo, got a lot of good feedback – more positive and constructive than usual, I’d say, which is nice. I also sent the article to DanC, who responded to me directly about it. He then wrote a G+ article about the topic of randomness, which led to a Lost Garden article. I feel happy to – at least partially – have been the inspiration for a Lost Garden article, being that that blog was my primary inspiration to begin writing about games almost a decade ago. My position is that output randomness should not be a part of ideal game design. Right now I’ll try to break down my reasoning into discrete blocks that should help conversation about it. 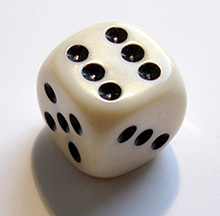 Output randomness is randomness that affects a game after the player’s decision that decides the outcome. So, I decide to attack, and then there’s a dice roll to see if it worked or not. That’s output randomness. Input randomness, on the other hand, would be something like map generation or some face-up market cards that are available to all players. Although there can be improper implementations of input randomness that cause it to have similar problems as output randomness, input randomness is not what I’m talking about in this article. I’ve put this in a list format. Please read each point, and let me know which point does not work for you, and why (if any). Point 1: The act of coming to understand something is of value to human beings. It is both enriching and entertaining to us, by our very nature. Point 2: Games are valuable to human beings to the point that they allow us to understand them. If a game leads us smoothly to understand its lessons (accessibility / easy-to-learn), yet also has a very long, seemingly endless set of lessons to teach (depth / difficult-to-master), then that is a game that has great value to humans. Point 3: A basic loop of game functionality can be described as the game presents choices to the player, the player makes decisions, and the game then returns feedback. Through this process, players obtain understanding. Point 4: Games (as defined here) are different than gambling applications. The value of gambling is not one of learning to understand. Instead, its value is in inducing compulsive play by randomizing reward schedules. Point 5: Many modern games that we know today are actually some mix of what I’ve described as “games” and what I’ve described as “gambling applications”. Most card games would be examples, and many of the top aussie casinos have begun to employ these after seeing the success rates from their North American predecessors. Point 6: What seems like a machine of understanding can later be discovered to not be a machine of understanding, but rather simply an illusion. A clear example is a 100% luck-based activity such as playing Candy Land. As children, we play Candy Land and believe that we have agency – that we have achieved some kind of mastery when we draw cards that help us. Later, we become able to put together that we personally had no role in the win or loss, and the game loses its value to us. Point 7: It is then reasonable to assume that there could be games that we enjoy even as adults which are illusory in a similar way. Of course, adults need the illusion to be stronger, so we need more of a framework of strategy to exist. This is why so many games are some combination of game and gambling application, and it’s also why different individuals want games with different levels of randomness. Point 8: Regardless of your level of mastery in a highly random game such as Poker, there are outcomes – feedback – that delivers zero understanding. For instance, you could know quite well what the odds are of a person having a certain card. You could know that the odds are 90% certain, and then make a move based on that understanding of the odds. Despite this, it could simply not be the card you expected. There is no reason, no lesson that can be derived from this event. Nothing was understood. Point 9: Of course, there is understanding to be gained in highly random games such as Poker. I’ve never said that highly random games have no strategy involved, but merely that at a certain point, the strategy gets largely solved and it breaks down into sheer gambling. Point 10: In such heavily random systems, it’s difficult to know exactly where strategy starts and where gambling begins. Feedback from a highly random game is unreliable. Point 10a: There is a finite amount of time that a player has to play a game. So, if a game is truly a deep strategy game and is highly random (therefore requiring many, many plays to get reliable feedback), it is not practical, and possibly impossible to achieve mastery in that game. Point 11: Depending on the game, some players won’t get to a point with most games where the system breaks down into pure gambling. However, some will. Point 12: I am concerned with developing a kit of guidelines for optimal game design – games that are better than what has come before. Point 13: Plenty of popular, well-liked games exist with no randomness at all. Examples would be Outwitters, Chess, Puerto Rico, and Go. Randomness should not be a part of ideal game design. Please read this section before commenting to avoid posing a straw-man argument. Clarification 1: I am not saying that heavily random games have “no strategy” or even “little strategy”. Clarification 2: I am not saying that heavily random games are “bad games” in any kind of general sense. I am instead saying that they are bad games insofar as I have defined the value of games in point #2. Clarification 3: I also understand that randomness can be a useful shortcut for game designers, particularly those designing party, family, or generally “light” games. For most players, the negative effects may be negligible and for players who do not play much, the positive may outweigh the negatives. However, I would say that this is “planning for low-depth”, which is only appropriate for some design objectives. I would also remind you that a non-random game can also make a good party/family/light game. Clarification 5: By “ideal game design”, I’m not talking about “the design of one singular ideal game”. I don’t believe in the idea of “an ideal game”. Instead, I’m looking for ideal guidelines for game design, in general. Clarification 6: Randomness as a mechanism can work in a game that is ABOUT judging odds. If the game is about tactics or anything besides judging odds, though, it seems like it would always be inefficient design, at best. So there you have it. My points, along with some clarifications. What points do you object to? Let me know. I’ll probably update this with more clarifications as people comment.